I'm concerned for both of them, but what I need your help with is Vlad's creatinine level. The lab reference range is .06-2.4 as normal (I saw on another site up to 2.5 is normal) and Vlad got 2.6. They want me to have him on a special diet for the next 3-4 weeks and then have him tested again. Can you give me any advice? I'm very concerned. I'm posting their results here. Well hello there stranger. I have missed you and your kitties here. I hope that the tests do not show anything serious. sorry just wanted to give a big hello to you. I'm hoping the creatinine is just elevated due to stress, AG. 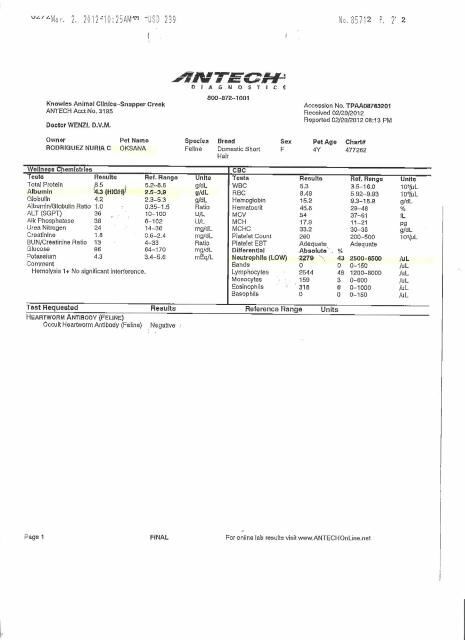 High creatinine occurs in large muscular cats - it's a by-product of muscle, as well as being an indication of kidney health it's considered more accurate than BUN/Urea because it not affected as much by stress/diet/dehydration. He's only 5 so it's unlikely to be CRF as that generally happens in older cats unless it's genetic (would've shown up before now). Acute kidney failure would have vastly high numbers. If his diet is mostly red meat or fish this may elevate the Cre numbers. There are a number of other things that can cause a rise in Cre with or without a subsequent rise in BUN ie high blood pressure, pancreatitis, diabetes etc most will have other increased blood values & depends on what symptoms he's displaying. Low platelet count followed by the comment "count reflects min number/adequate due to clumping" means with a number that is not too low, the count is a rough estimate of actual numbers but the lab couldn't quite tell as some are clumped together - it's common as long as the number is adequate & isn't really low. Lymphocytes being low commonly occur due to stressful situations - being at the vet is the #1 cause of low lymphocytes also viral infections, chronic bacterial infection though you will see other signs in the blood work. Cancers will also cause low lymphocytes but again you'll see other signs as well. Vlad is the one that gets so very stressed at/going to the vet isn't he? Neutrophils are the first responder of the white blood cells, fighting infection or inflammation. Cats that are low in Vit B12/Folic Acid can have low neutrophil numbers. Oksana's other WBC & her RBC counts are fine, so unless she's got an injury that is producing inflammation or a viral infection - not too likely as they're not roaming outside, I would think the likely cause is dehydration & low Vit B from eating little. Oksana has always been a picky/small eater hasn't she? Especially if the others are around right? I know it's sometimes hard to tell with multi cat households but have you noticed a change in their litterbox habits? What & how much are they currently eating? All blood/urine values fluctuate throughout the day so it's possible the numbers might have tested normal at a different or less stressful time of day. 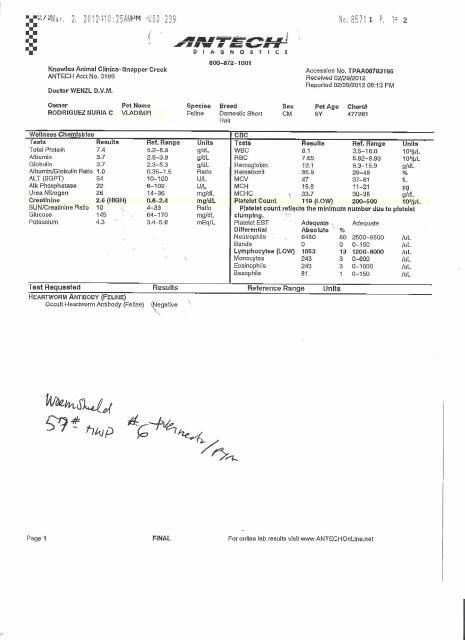 It wouldn't hurt to test out the food for a few weeks to see what the results show, I'm not seeing kidney issues from those blood results but there was also no urine test to check for specific gravity which is key in kidney testing. Honestly the blood tests aren't showing me anything alarming unless they are also displaying symptoms that are of concern. He's a big boy, but he's lost some fat. They all have though. Over the last year they have all lost about 1-2 pounds because I've been measuring their food more, just to help stretch it out. Yes, he gets VERY stressed out. So much so that they have to sedate him, give him gas, and even then he fights it. She's been eating better, but she's never been a heavy drinker. They aren't showing anything odd. Vlad's ears aren't hot, but they are warm, what would that indicate? I haven't noticed anything odd. They all are going daily, but not excessively. Since I had to start Oksana on Royal Canine SO becuase of her constant UTI's, they have a can of that mixed with a can and a half of Friskies special diet for urinary. I add 8 tablespoons of water to that and then break some freeze dried chicken over their dishes. I'm going to talk to their regular vet about getting some urine tests. At the very least, it will ease my mind. They don't start including that in the wellness exams until the Senior wellness, at around 6 years old. I can't tell you how much I appreciate you getting back to me so fast and taking the time to look at their tests. It's eased my mind. I just was so freaked out. I still am but not to the degree that I was. THANK YOU! Vlad might also have lost some muscle mass, that usually burns faster than fat does, that could've caused a spike in the Creatinine levels since it's a byproduct of muscle wasting as well as muscle gain. The lymphocytes being low due to stress is common & called stress lymphopenia. That's right Oksana is prone to UTIs - that'll explain the low neutrophil levels - they're fighting the infection from the urinary tract & UTIs always make the cats pee more so that explains her high albumin dehydration factor. Hot ears on a cat, that has not been laying in the sun, under a blanket or some other very warm spot, can indicate high fever or stress levels - when Duffy was having a severe allergic/pancreatic reaction to raw duck there were numerous symptoms she was displaying & one of them were her ears were burning hot to the point I was attempting to cool her down w/cold wet towel over her head. I can see that happening then. They have all lost weight, but you can see it more in Vlad because he's such a big cat. Yes, she had a period a little over a year ago where she was getting them every couple of months, which is why I just broke down and started feeding the Royal Canine SO. She's not had a bout in a long time. I practically never see her drinking water. Neither she and Vlad really do, so I've been adding more water to their food. Czari drinks often, and I have caught Maks and Kiska drinking now and then. I wonder if adding Lysine to Oksana's food may help strengthen her immune system to help her fight anything off? Ah, okay. I spent most of the day yesterday touching his ears and they were pretty cool. They do get a bit warm sometimes, not too warm but at least I'll know to start worrying of they get really hot. I'm going to have a talk with their regular vet this week. I want to discuss what the other vet told me and see what she thinks we should do. I just want to cover all the bases. If I need to have him take a urinalysis, to make sure everything is good, then I'll have to take him in. Same for Oksana. Thanks again for helping decipher all of this. I've got a lot more information now which is ALWAYS good. I spoke with the Gang's vet this morning. She's not worried about Oksana's results, but we decided to put Vlad on some special kidney food for about a month, then we'll retest hm. We'll see what his creatnine levels are, then get him off the food for a month and see what his levels are then. His vet said everything else is normal, which is good. She said in her gut she thinks it's just a fluke. He was off that day. He'd coughed up a terrible hairball, so that made him feel yucky, so she said that also may have been part of it. I felt a little better after talking to her, and she said worst case scenario, if he's got anything we are catching it early. On a side note, I just heated some sweet potato for Sofie and gave some to Vlad, and he loved it. I'm thinking if too much protein might be an issue for him right now, I can break it up by giving him a little bit of sweet potato once or twice a week.